This tropical plant with its vivid, nearly year-round blossoms and lush foliage adds a touch of beauty to any room. It arrives blooming in its red and white beehive container, which perfectly contrasts with the brilliant flowers and deep green leaves. 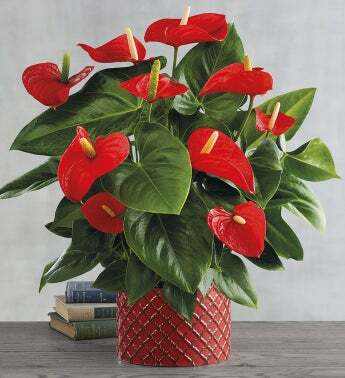 The anthurium will thrive in indirect sunlight. Be sure to allow it to dry out after each thorough watering. Care instructions are included.